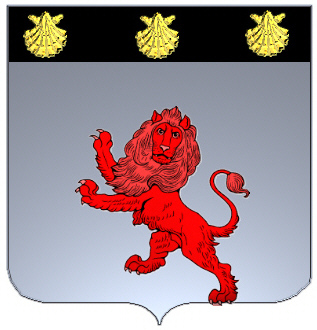 Coat of Arms: Silver shield with a red lion and on a black stripe at the top three gold escallop. "This name is probably derived from "rous" meaning red and early bearers of the name no doubt had red hair - and were probably of Norman or French extraction. While the name is by no means confined to Scotland, it is within the top 50 most frequently found names in the country. The name is one of the earliest surnames recorded in Scotland, the first being a Walter Russell who witnessed a charter in Paisley Abbey some time between 1164 and 1177. John, son of Robert Russel of Duncanlaw granted land to found a Hospital between 1180 and 1220. Robert Russel of Berwickshire was a big enough landowner to be required to sign the Ragman Roll and pay homage to Edward I in 1296." From a nickname which meant "little red one" in French, perhaps originally describing a person with red hair. Badge: A lion rampant, holding a dagger in his paw. Septs of the Clan: Buchan, Comine, Comyn, MacNiven, Niven, Russell. This name 'Russell' is probably derived from "rous" meaning red and early bearers of the name no doubt had red hair - and were probably of Norman or French extraction. While the name is by no means confined to Scotland, it is within the top 50 most frequently found names in the country. The name is one of the earliest surnames recorded in Scotland, the first being a Walter Russell who witnessed a charter in Paisley Abbey some time between 1164 and 1177. John, son of Robert Russel of Duncanlaw granted land to found a Hospital between 1180 and 1220. Robert Russel of Berwickshire was a big enough landowner to be required to sign the Ragman Roll and pay homage to Edward I in 1296. Russels can be found in Aberdeenshire where Rozel, an English baron who had fought at the siege of Berwick and the Battle of Halidon Hill in 1333, obtained an estate at Aden. The family was described as "Russel of that Ilk" implying that they were substantial landowners. As such, Russel is one of the clans and families of Scotland with a coat of arms recognised by the Lord Lyon. Not all Russells were recorded for their good works. Jerome Russell, a monk, was burned at the stake in the High Street, Glasgow, for heresy in 1539. There was a significant family of Russels in Selkirkshire in the Scottish Borders and many entered military service in India in the 18th and 19th centuries. In England, a family which began with a Rufus (another form of Russell), rose to become the Dukes of Bedford. The 3rd son of the 6th Duke of Bedford studied at Edinburgh University where he was greatly influenced by the independent and democratic philosophy taught there. He became a great Reformer and was an architect of extending the franchise for the Westminster parliament in the first Reform Act of 1832. His grandson, the 3rd Earl Russell, was also an independent thinker, better known as the philosopher Bertrand Russell. Russell was the 47th most frequent surname at the General Register Office in 1995. A patronymic name derived from the given name "Rousel," old French for someone with red hair or a red face.